NEW ORLEANS (CNS) — Father Tim Hedrick, parochial vicar of St. Catherine of Siena Church in Metairie, was in Washington continuing his canon law studies when a news alert came across his phone June 14 that Louisiana Congressman Steve Scalise, the House majority whip, had been shot. “I immediately called and texted Jennifer (Scalise’s wife) to let her know that I was here (in D.C.) and would go and be with Steve,” Father Hedrick told the Clarion Herald, newspaper of the New Orleans Archdiocese. Scalise, his wife, Jennifer, and the couple’s two children, Harrison and Madison, are Catholic and are parishioners of St. Catherine. Father Hedrick said Jennifer Scalise, who was back home with the children in Louisiana, called for a police detail to pick up the priest from The Catholic University of America to take him to MedStar Washington Hospital Center, where Scalise was being treated. “He was already in surgery, and they brought me down to surgery and I actually got to watch the surgery,” Father Hedrick said, who learned that several members of the surgery team were Catholic. “They felt very comforted to know I was there, and they asked me to pray for them,” Father Hedrick said. He was at the hospital for 12 hours that first day and was able to give the sacrament of the anointing of the sick to Scalise. As early June 19, Scalise remained in serious condition. Over the June 17-18 weekend, he was upgraded from serious condition. He has undergone several surgeries since he took a bullet to the hip early in the morning of June 14 while at a baseball practice in Alexandria, Virginia. Doctors at MedStar Washington Hospital Center said the bullet fractured bones, injured internal organs and caused severe bleeding. Scalise and fellow GOP House members along with staffers and others were practicing for the annual Congressional Baseball Game, which is played for charity. Four others, including Capitol police officers who were on Scalise’s protective detail, a congressional staffer and a lobbyist, also were injured. The shooter, now identified as James Hodgkinson, died at the scene. Father Hedrick said he also has taken on the role of Jennifer’s communicator of Scalise’s condition with St. Catherine parishioners. Scalise, who represents Louisiana’s 1st Congressional District, had participated for several years in the congressional baseball fundraiser since being elected to office in 2008. The game, with the GOP lawmakers versus Democratic House members, went on as scheduled the evening of June 16. 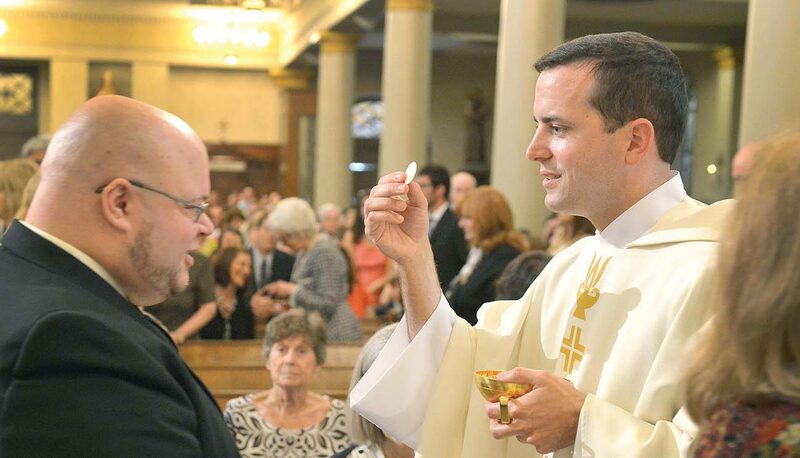 Father Hedrick has been parochial vicar at the Scalises’ parish since July 2014. “I know him in my role as a priest and fellow (Archbishop) Rummel (High) graduate. And they (the family) come to church,” he said. Father Hedrick said he has been in Washington the past three summers studying canon law and has visited Scalise in his congressional office. Since the shooting, Father Hedrick said has visited the Scalises every day. He was present when President Donald Trump and first lady Melania Trump visited Scalise in the hospital and learned the president had called Jennifer immediately after the shooting. Residents of Scalise’s hometown of Metairie have shown their love and concern. On the evening of the shooting, St. Catherine of Siena held a short prayer service for the Scalise family and all those injured. Several groups, including the Knights of Columbus, also were rallying to schedule blood drives on Scalise’s behalf; he has had several blood transfusions. Archbishop Rummel High School, where Scalise graduated in 1983, planned a drive June 23. Father Hedrick said Archbishop Aymond called Jennifer the day of the shooting and offered his prayerful support. Father Hedrick considers it providential that he was in Washington when Scalise was shot and in such close proximity to the hospital where he was taken. MedStar Washington Hospital Center is three blocks from Catholic University. He said he also has gotten to know the Capitol police officers injured with Scalise on the baseball field, because they accompany the congressman to Mass when he is in Metairie. Father Hedrick is glad he can be there for them as well and said they were doing OK after the shooting. Father Hedrick said Jennifer Scalise asked everyone to keep praying for her husband, the other who were injured, the medical staff and her family. Scalise will remain in the hospital for some time and faces rehabilitation. The MedStar staff said other surgeries are necessary to manage abdominal and bone injuries. I know Father Tim being there is a comfort for Steve and his family. Thank you for your devotion Father Tim.